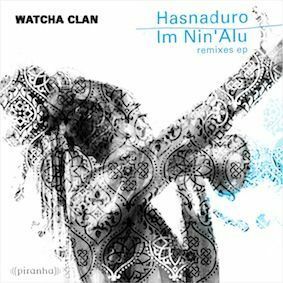 World Music groovers Watcha Clan have this week released a 6-track remix EP of "Hasnaduro" and Ofra Haza's classic "Im Nin'Alu", two tracks from their last album ("radio Babel" which reached No 3 in WorldMusic.co.uk's Top 20 World Music Albums of 2011 - review here: www.worldmusic.co.uk/watcha_clan_radio_babel). Album details: WATCHA CLAN: "Hasnaduro/Im Nin'Alu Remixes EP #2"
For over ten years Watcha Clan has been one of the most innovative music collectives for globally inspired grooves, always exploring new sounds from their inspirational headquarters, the melting pot of the Southern French city of Marseille, one of the oldest cradles of Mediterranean culture. Following their highly praised studio album "radio Babel", Watcha Clan have kicked off a series of three digital-only EPs created in an interactive process with their fan base and professional music colleagues all over the world. The first EP, "We Are One Remixes EP #1," was released on 22 October 2012. Watcha Clan's second EP, available from 21 January 2013, consists of six remixes of two tracks from "radio Babel"- "Hasnaduro" and "Im Nin'Alu". Top remixers Shazalakazoo, Kosta Kostov, Dr Cat, Dr Das, Maga Bo and DJ Delay, from places as far afield as Belgrade, Cologne, the Bulgarian Black Sea Coast, London, Rio de Janeiro and Melbourne, worked with Watcha Clan on creating new fresh sounds without losing their originality and meaning. "Hasnaduro" is an example of cultural convergence, merging various styles from all over the world. "Im Nin'Alu" interprets a 17th century Hebrew poem by Rabbi Shalom Shabazi, most famously covered by late Israeli singer Ofra Haza. It pictures a spark of hope, allegorising the divide between rich and poor. Watcha Clan are fronted by vocalist Sista K. She was born to an Ashkenazi Jewish Polish mother and a Sephardic Jewish Berber father, an Algerian independence fighter who was French before he was born (a 1870 decree gave French nationality to the Jewish population of Algeria). Her parents met in Israel but Sista K was born in the Bonne Mère district of Marseille. "Back then," she says, "in the northern quarters of Marseille, no-one cared about who was Jewish and who was Muslim. We all lived together, and life was always stimulating." As well as being influenced by the sounds and people of Marseille, the cosmopolitan singer took inspiration from the Eastern European melodies her mother sang to her when she was little. Joined by a multi-cultural cast featuring producer/keyboardist Suprem Clem from the French Alps, bassist Matt Labesse from the island of Corsica, and vocalist/guitarist Nassim Kouti from Oran in Algeria, connecting the European and Middle Eastern worlds has been the band's calling card for a decade. "We always like the idea of bringing together sounds of different cultures through our work. Therefore it was sincere fun to work on the remix of Watcha Clan's "Hasnaduro", a track where gnawa music meets kuduro in the pure clubby way with a hint of coupe-decale and even some Dutch house on top of it all." "First time I heard Watcha Clan I knew I wanted to work with them. When I finally met with Clem at their London gig, one track was still ringing in my ears well after the gig was over, "Hasnaduro". I loved it so much , I had to remix it." "Ofra Haza's "Im Nin Alu" is one of my favourite ever songs. When I heard Watcha Clan's version, I was particularly impressed by Sista K's fantastic vocal interpretation and straight away wanted to play a phat dub bass melody and add some dirt to the production. A real pleasure to work on."